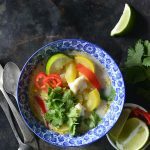 The Best Thai Coconut Curry Recipe with Fish! Getting bored with your same old cod or tilapia recipe? Spice up your meals with our fantastic Thai Coconut Curry and fish! Whip up this tasty new meal for you and your family in just 15 quick minutes! 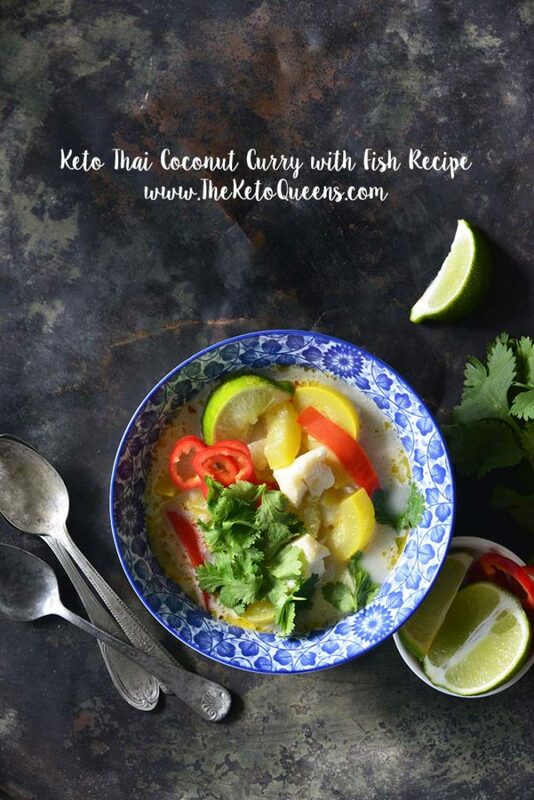 Aromatic with garlic and ginger, this Keto Thai Coconut Curry with Fish is as delicious as it is healthy. It features a balanced flavor profile and has a ton of veggies. 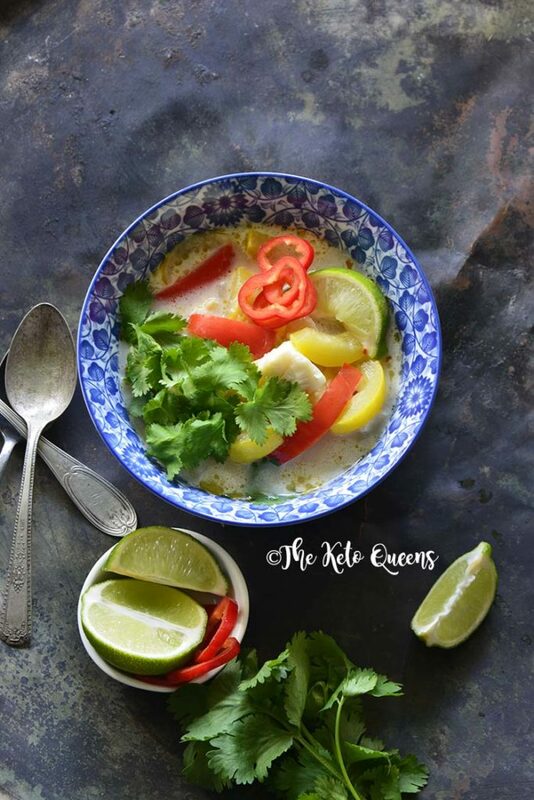 Creamy coconut milk gives the broth flavor, body, and richness, and a squeeze of fresh lime juice at the end brightens up all the flavors! This Thai coconut curry recipe is from our Freezer Friendly Family Dinner Recipe Ebook. This recipe is insanely easy to make and like the ebook title states, is freezer friendly too, which is perfect to prep for the week ahead! Our e-book is now on sale on for just $2.99! 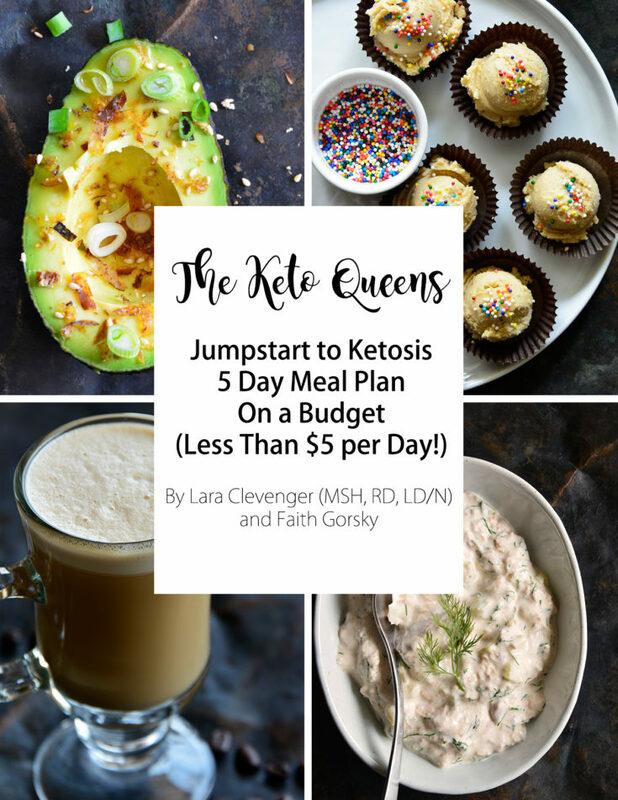 We’ve also included this ebook in our ULTIMATE KETO EBOOK BUNDLE for only $19.99. 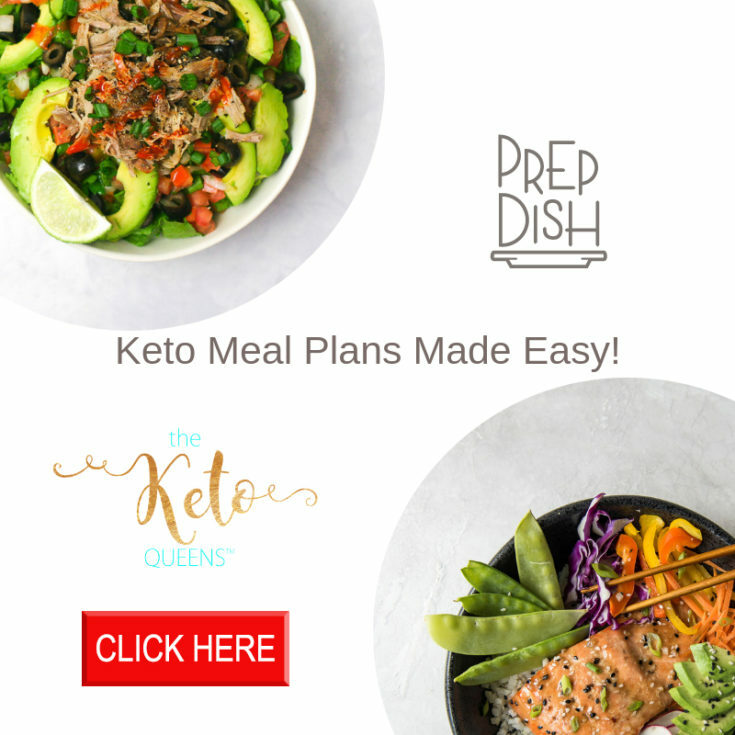 It includes all 9 of our ebooks and meal plans! If you love the ebooks, join our affiliate program and earn 40% on each ebook sale you refer! There are so many ways to use coconut, so why not make it into a curry? We came up with this crazy delicious recipe that marries two of our favorite things… coconut and Thai food! The flavors in this dish come together so beautifully, you’ll be making it again and again! What is Thai Coconut Curry? Thai coconut curry is a Thai inspired recipe that leaves you with savory, creamy, and fresh flavors all balanced in harmony. 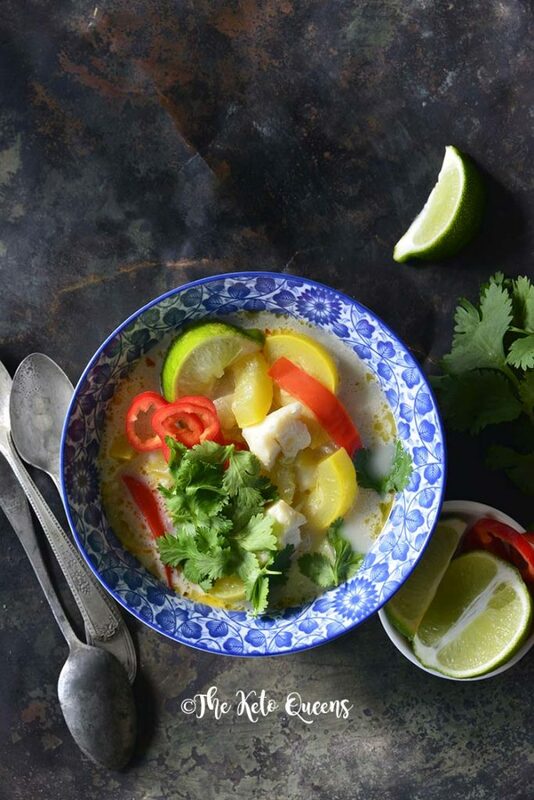 Also known as Thai coconut curry sauce, this recipe with leave you wishing you had leftovers! How do you make coconut curry thicker? To thicken a normal coconut curry, you would combine and stir one tablespoon of cornstarch with two or three tablespoons of cold water. Pour this mixture into your curry and let it simmer until it thickens. BUT since this is a keto coconut curry, if you want it thicker you can thicken it with unflavored beef gelatin or xanthan gum. We actually prefer not to thicken this recipe, but it’s totally up to you! Is coconut curry good for you? This coconut curry recipe is loaded with ingredients that are high in nutritional value. Avocado oil, coconut milk, and cod contain healthy fats that are important for heart and brain function. And of course all of those vegetables that we snuck in there! Can you thicken coconut milk? To thicken coconut milk, a popular method is to use the same technique we described above for thickening Thai coconut curry. An alternative to this would be using coconut cream as a substitute, as this is already thicker than coconut milk. Why does coconut milk separate? Coconut milk separates naturally into a thin, milky liquid and a thicker, creamy substance. Strategies to avoiding this separation include shaking the can before opening it, using an emulsifier such as honey in the recipe, and being sure to keep the Thai curry at a simmer rather than a boil while cooking. Is coconut milk in a can supposed to be solid. When coconut milk is set at room temperature, a portion of it begins to separate over time. This results in a solid portion and liquid portion inside the can, which is natural and can be resolved by shaking the can or heating the solid portion to liquify it. 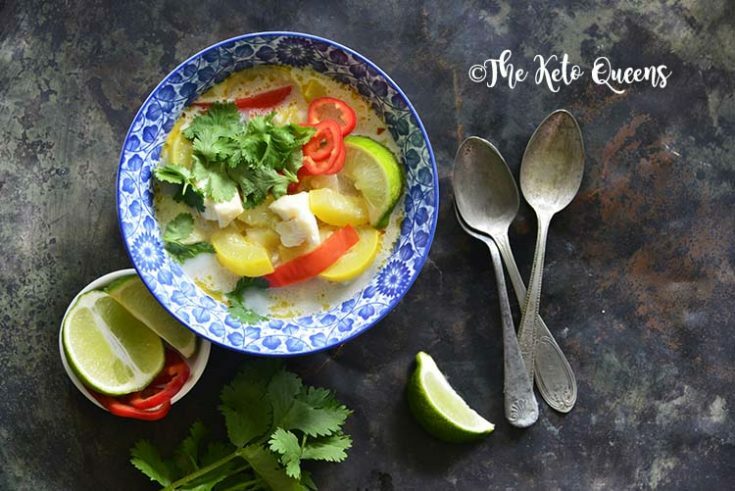 What’s in Thai Coconut Curry? First, add oil to a 3-quart saucepan over medium-high heat. Then, add onion, bell pepper, and yellow squash and cook until starting to soften, stirring occasionally. Next, add garlic and ginger and cook 30 seconds, stirring constantly. Then, stir in tamari sauce, fish sauce, salt, red pepper flakes, water, and coconut milk. Bring to a gentle simmer and then add whole cod filets. Then, cover saucepan, turn heat down to simmer, and cook until fish is opaque and flakes easily. Taste and add salt and black pepper as desired. Thai curry recipes typically use curry paste and fresh herbs where as Indian curry recipes usually opt for a dried spices instead of pastes. Thai curries usually are broth based and more soup like, are are filled with vegetables, seafood or chicken and fresh herbs. Indian curries are typically yogurt or cream based. Any of these low carb curry recipes would pair nicely with our low carb Indian Flat bread recipe. Also, if you are looking for other low carb Indian foods, check out this low carb Indian Food roundup post we wrote. Add the oil to a 3-quart saucepan over medium-high heat. Once hot, add the onion, bell pepper, and yellow squash and cook until starting to soften, about 3 minutes, stirring occasionally. Add the garlic and ginger and cook 30 seconds, stirring constantly. Stir in the tamari sauce, fish sauce, salt, red pepper flakes, water, and coconut milk. Bring to a gentle simmer and then add the whole cod filets. Cover the saucepan, turn the heat down to simmer, and cook until the fish is opaque and flakes easily with a fork, about 10 minutes. Taste and add salt and black pepper as desired. Serve garnished with fresh cilantro and lime wedges, if desired.